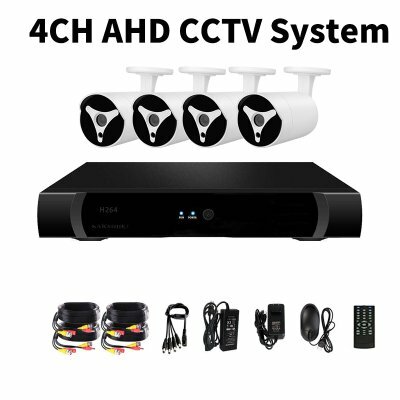 Successfully Added 4 Channel AHD DVR System - 4 HD IP67 1080P Cameras, Motion Detection, 30M Night Vision, Remote Monitoring 1TB HDD to your Shopping Cart. 4 Channel AHD DVR kit with four cameras is an inexpensive security system that's quick and easy to deploy and brings comprehensive surveillance. Including 4-night vision cameras, all you need is a simple display and some coaxial cable to have a complete security system at your disposal. The cameras’ video streams are encoded by the DVR using the h.264 codec as it writes to the HDD. This allows the video files to be effectively compressed without degradation to quality for far better storage. The DVR comes kitted out with a 1TB hard disk drive that can easily be swapped for a higher capacity one (up to 6TB) if required. The 4 rugged cameras that come with this DVR kit have a full metal body construction and with their IP66 cases, they can be located indoors or out. Each camera has a 1/3 CMOS sensor capable of capturing high definition 1080p video at 25 or 30 FPS so you get excellent footage. With their 18 IR LEDS they can see up to 30 meters at night and the fully adjustable wall brackets let you mount them at any conceivable angle.